In your academic path as a future health provider, were you taught to treat diseases or people who have diseases? Consider the clinical case of a patient with various symptoms. If it came up on a test, the following question would be “how should you proceed next?”. That will lead you to follow specific guidelines depending on the patient’s physical condition. However, the more strategic question to ask is “what are the health determinants that should be taken into consideration in the management of this patient’s case?”. This mirrors a real life approach that is inclusive of the patient’s social, mental, environmental, and emotional states. The ideal way to handle two patients with similar physical symptoms might differ when you look at the bigger picture, and that is what Family Medicine physicians call a holistic approach. The World Organization of Family Doctors (WONCA) aims to improve people’s quality of lives through comprehensive and continuous care that focuses on communities. It’s not always an easy task for family physicians, who are constantly “facing the growing challenges of maintaining the integrity of the human being while bridging the increasing gaps between specialists, and of providing humane medical care while keeping up with technological advances”, clarifies Dr. Jinan Usta, the WONCA EMR President. 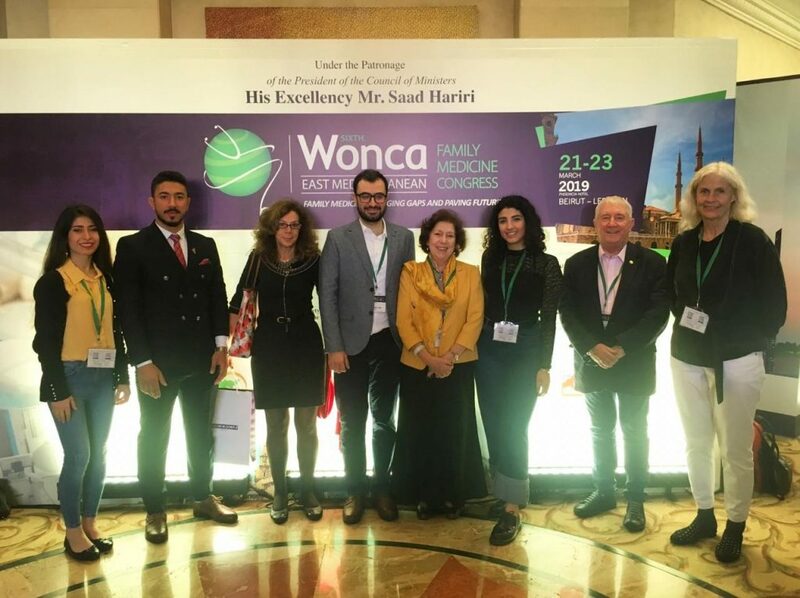 “Bridging Gaps and Paving Future” is the theme of the 6th Wonca East Mediterranean Congress that took place in Beirut, Lebanon, between the 21st and 23rd of March, 2019. This scientific and networking event gathered family physicians from all around the EMR, as well as highly respected international and local speakers over an intense schedule of symposia, debates, and workshops. 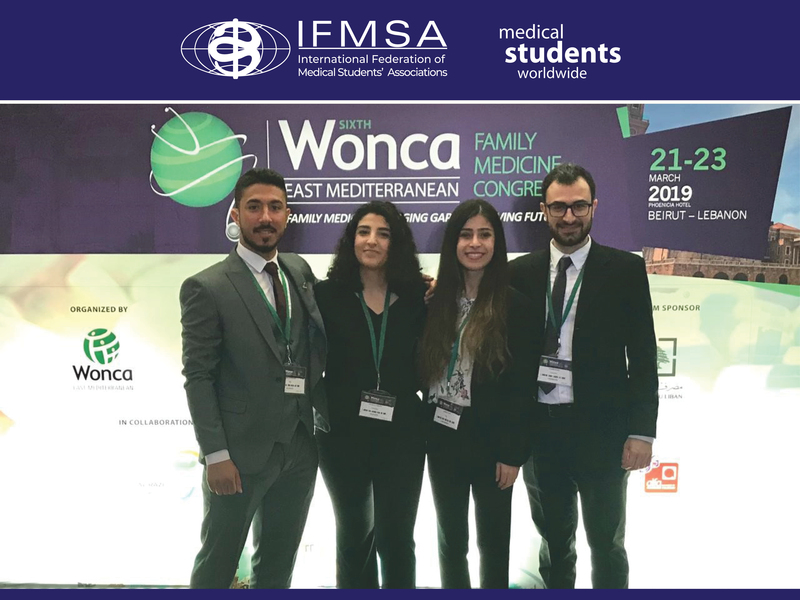 The IFMSA Delegation to the congress had an active role to play, and its participation was recognized and appreciated by Wonca Executive Board Members, and physicians. The delegation was composed of Adonis Wazir, the Regional Director for the EMR, Shewaz Tariq, IFMSA-Kurdistan NMO President, Abdullah Al Khafajy, IFMSA-Iraq NOME, and myself, Celine El Khoury, LeMSIC-Lebanon VPCB. Among other things, the IFMSA was thoroughly engaged in promoting equity through the inclusion and meaningful advancement of all groups of people, particularly women and young girls, in the context of healthcare, treatments, and other societal initiatives. “Family practice got recognized as the best model to provide Universal Health Coverage” continues Dr. Usta, “creating the need for more family physicians in the region”. Hence the role of the IFMSA in the development of an undergraduate curriculum that promotes Primary Healthcare through Family Medicine, and with the collaboration of the WONCA Working Party of Education, the IFMSA facilitated a session on Social Accountability in medical schools, and the role of its implementation in reaching Universal Health Coverage. In addition, we advocated for medical education through an oral abstract on the IFMSA 2020 Climate Change and Health Vision in Medical Curriculum. Throughout our journey, we came up with resolutions targeting the empowerment of medical students by integrating core competencies development in medical education. The aim is to shape health leaders, with a multidisciplinary approach that will allow future family physicians to coordinate between different medical specialties. It is also crucial to note the importance of activism through the establishment of policies, and the creation of health systems with added values, including but not limited to cost-effectiveness and high-quality services. The rise of these leadership and advocacy skills is the key to solving the challenges faced by family practitioners in the EMR, therefore “bridging gaps and paving future”.